Beautiful buildings and meandering alleyways in the Bairro Alto district. There’s a reason this is number 1 on the list of not-to-miss. While in Lisbon there was not one day where we didn’t have a pastel de nata in the morning... and often more than once during the day. These custard filled tarts which are the Portuguese version of a Chinese egg tart (which I’m also obsessed with) were my favourite snack during the entire trip. The most famous in town are the ones from Manteigaria, although my personal best was in Belem (which are actually called pasteis de Belem, more on this later). The best places serve them warm with powdered sugar and cinnamon. Yum. Now I’m on the hunt for the best pastel de nata in Toronto. The prettiest flower shop I've ever laid eyes on. You’ll see Sintra on almost every Lisbon travel guide. That’s probably because its earned its place. There’s several palaces and gardens throughout the national park but the most popular is Pena Palace. A UNESCO World Heritage site, its beautifully vibrant walls are nothing I’ve ever seen. My biggest advice, which we failed to take ourselves, is to go early. We arrived at Pena Palace around noon and oh, packed was an understatement. For example, that photo by the three windowed arches... we waited over an hour for those opportunities. Yep, just go early and avoid the harsh midday lighting and crowds. Don’t do what we did. Unfortunately we didn't get a chance to explore any of the other main sites in Sintra due to some unforeseen circumstances, but there's definitely enough in the area to extend the day trip. The busiest spot in all of Pena... these picturesque sets of arches. Porcelain tiles were everywhere in an assortment of patterns. Cabo da Roca, the easternmost tip of continental Europe. To get back to Lisbon, we took a bus from Sintra towards Cabo da Roca, the easternmost tip of continental Europe. If an endless ocean view and soaring cliffs are your cup of tea, definitely make a pit stop there. Be forewarned though, it is WINDY which makes it really cold despite the 30 degree weather otherwise. I was definitely not appropriately dressed for the wind or the steep and rocky climb down, being in a wrap skirt, strapless basket bag and sandals. If you're afraid of heights though, the climb down may make your knees weak—I could not stop shivering (both from fright and cold)! There is a spectacular viewing platform that doesn't require you to climb down any rocks if that sounds like too much, so it's still a worthy stop. You can catch the bus from Cabo da Roca to continue into Caiscais, where the train will return you to Lisbon. Caiscais is a quiet resort town by the sea and the meandering streets reminded me of Lagos. If you're looking for a quick retreat from the city, Caiscais is a great option. I would have loved for more time to explore its attractions. A break, and a beautifully pink sunset at Caiscais. The infamous and picturesque Tram 28 that runs throughout all of Lisbon—at one point it sort of felt like it was following us around the city! European cities always have these amazing, characteristic neighbourhoods and winding side streets that are so wonderful to get lost in. Each turn is a different set of beautifully placed buildings and my favourite thing is to wander through them without an aim. 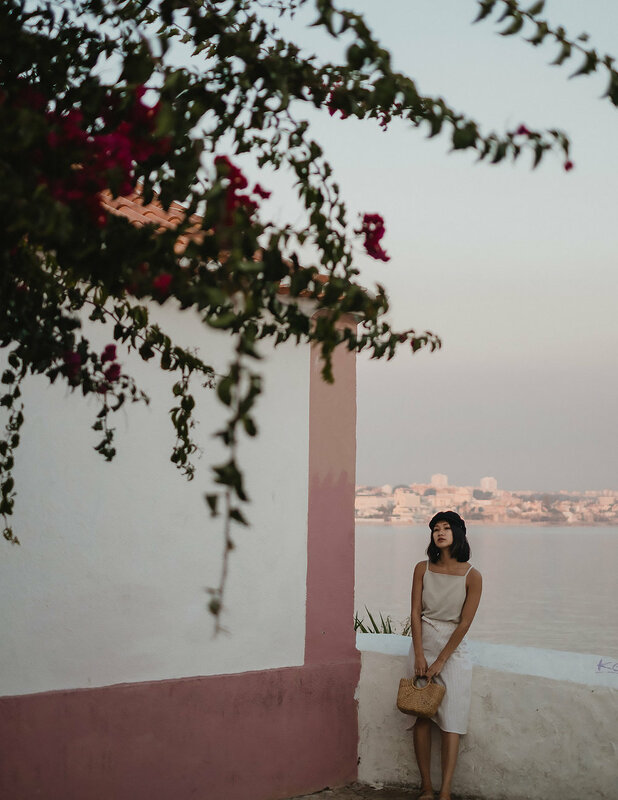 Lisbon's central neighbourhoods were Chiado (shopping), Baixa (downtown), Alfama (medieval quarter), and Bairo Alto (bars and nightlife, also where you'll be able to snap that infamous downhill tram photo). Beware though, streets can get steep—very steep, and despite how pretty they look, cobblestones are not the most comfortable walking surface. Any time I'm in Europe, I know flat and comfortable walking shoes are a must. Leisurely mornings at our Airbnb. Of course I had to stop and snap about 100 photos in front of this door. Panoramic view of Lisbon, atop Castel de Jorge. Lisbon is known for its signature orange roofs. At sunset, these roofs light up in the sun’s rays. ‘Miradouro’ in Portuguese literally means, ‘viewpoint,’ so you can probably imagine why they’d be a great location at sunset. Miradouro de Santa Luzia (for the most amazing bougainvilleas) and Portas do Sol are both popular spots and within a 1 minute walk apart, but there are tons scattered throughout the city. It does get very busy, especially at Portas do Sol when we went, but people flow in and out, so you should be able to grab a spot when that happens. Taking a moment at Jerónimos Monastery in Belém. 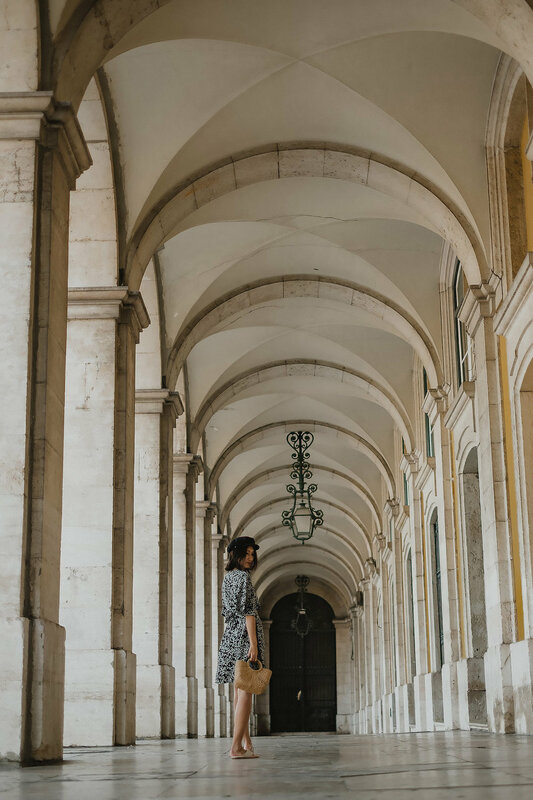 The Jerónimos Monastery in Belém is a must-see, especially if you're a fan of Manueline design. Pro tip: you can skip the enormous wrap-around line outside by buying tickets from the Archaeology Museum next door in the same building. The actual monastery itself doesn't take long to walk through, but there's a few interesting exhibits inside, including a 500-year recollection contrasting significant events which happened each year over the history of the Monastery, Portugal and the world. Apart from waiting for tourists to walk out of my photo frame, I spent the longest time reading through this exhibit! The monastery really speaks to itself in its beautifully intricate architecture, words don't do it justice. Right beside the Jerónimos Monastery is the famous Fabrica de Pasteis de Belém cafe. Don't leave Belem without trying their tarts! Just make sure you call it a pastel de Belém, which is the original version of the pastry. The pastries were actually created by the monks at the Jerónimos Monastery back in the 18th Century, when egg whites were used to starch clothes, which left an abundance of yolks for pastry and cake making! When the monastery closed down, the monks sold their recipe to the owners of the next door sugar factory, who opened and still own Fabrica de Pasteis de Belém today! Phew, didn't think you would get a mini history lesson on my blog, did you? Back to the important bit—the food. There's differing opinions about which one is better, but I prefer the pasteis de Belém. I would describe it as a lighter and fluffier version of pasteis de nata, the custard is a lighter colour too and has a milder flavour than the traditional ones found throughout other cafes. Finally, if you like seafood, I highly recommend having dinner one night at Cervejaria Ramiro. They don't take reservations so make sure you go early. We arrived at around 7PM and only waited for 30 minutes, but the crowd outside was huge by the time we finished! Also, don't wear your nice clothes or white (which of course I just happened to do both), because it gets messy! Don't expect a fine dining experience, you're down in the trenches using your hands and hammering open your own shellfish. Seriously, they give you a rubber mallet. Being Chinese, this isn't a brand new experience for me but I can imagine how odd this might sound! So so worth it though. A Vida Portuguesa: a cool shop that sells only Portuguese-made items with all sorts of things from pottery to soaps to candles and spices. Feira da Ladra: an antique market recommended by our AirBnb host that I would have loved to check out but never got the opportunity to. Castelo de S. Jorge: a Moorish castle with a fantastic panoramic view of the city and lots of history behind it. Time Out Market: an indoor food market with stands from restaurants around the city, unfortunately when we went it was the morning so most vendors hadn't started serving meals yet—but everything on the menus sounded amazing. LX Factory: a similar vibe to LA's art district (but not as big), lots of hip cafes and independent shops for the contemporary design aficionado. Next time I visit, I would also love to go on a walking tour to learn about the city's history. I just think it's such a great way to see and learn about a city, rather than running around trying to take the perfect photo (which guiltily I tend to do a lot of). Although we were only in the city for 4 nights, it felt so much longer, especially thinking back now to how many things we managed to do in a day. 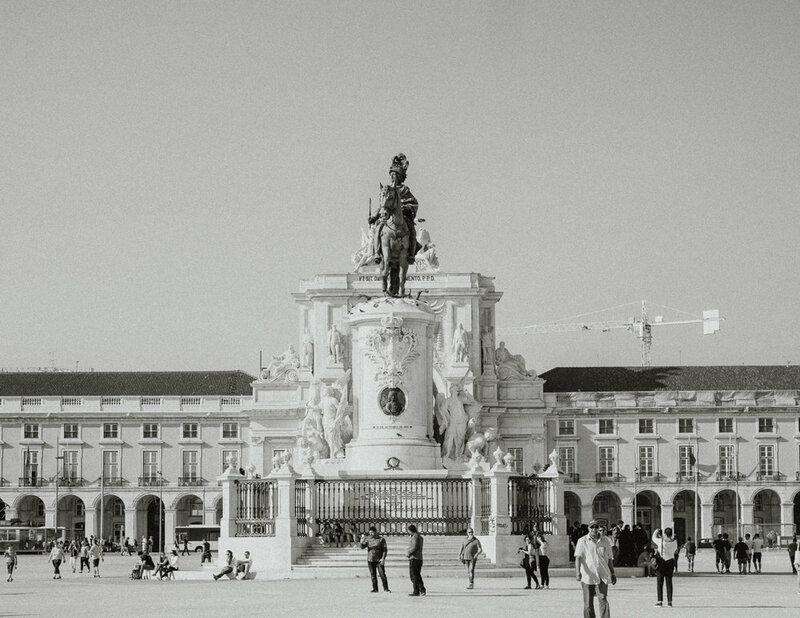 If you're planning a trip to Lisbon, feel free to message me - I'd be happy to answer any of your questions!